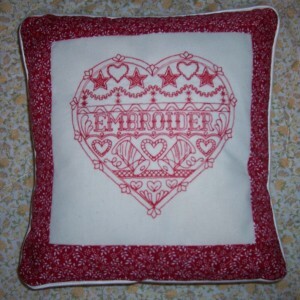 In the past I have made many scented cushions which feature lovely machine embroidery designs. Here is the most recent which has a central design in “Redwork” . The design was purchased from www.emblibrary.com – my first port of call when looking for new designs. I have a set of heart designs featuring different crafts as demonstrated in a previous post – A New Knitting Bag. I completed the scented cushion which is approximately 11 inches square, using a Red and White “ditsy” printed cotton for the borders, a narrow satin piping and envelope closure on the reverse. The scent is provided by a sachet of “Blushing Tulips” granules from Greenleaf. I still have several more embroideries to complete and they will be appearing in future blogs – in 2015!